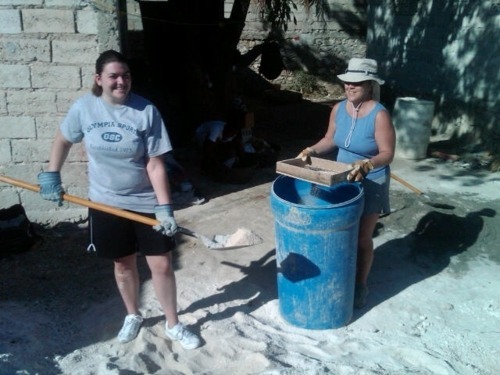 Anna and Robin sifted gravel to make mortar and got to know each other while they were at it. Anna spent the day at the construction site sifting fill in the morning and digging a foundation in the afternoon. Go Anna. Brett and Christine work in the lab with Ledy, who has been working in the PID clinic lab. They also worked today to teach others to man the newly stocked lab after they depart from Haiti. Sarah, hailing from Lee NH (Go New Hampshire!) 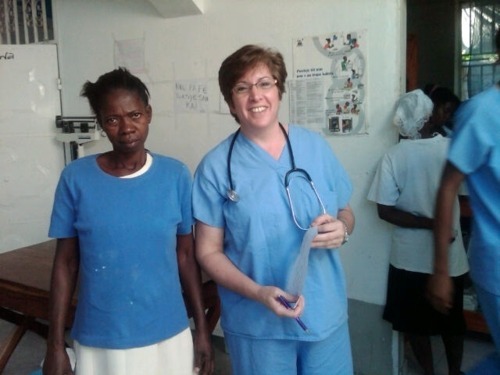 works with a patient in the PID medical clinic. She accomplished a lot with the short amount of time she had after her trip was cut short due to the blizzard. With the unsponsored kids coming tomorrow for a party, a few members of the group took to the kitchen and prepared gift bags of popcorn and cookies for the kids. Meanwhile, the rest were being entertained by one of the sponsored children in a fun game of soccer (football). At dinner, we all reflected on the week and shared what we each are going to take away from this unique experience. A common observation was how happy these people are despite not having most of the things that as americans, we take for granted. Tous les personnes ont eu un bons jour et nous sommes tres excite pour le prochein , j’espere que ca c’est raison.